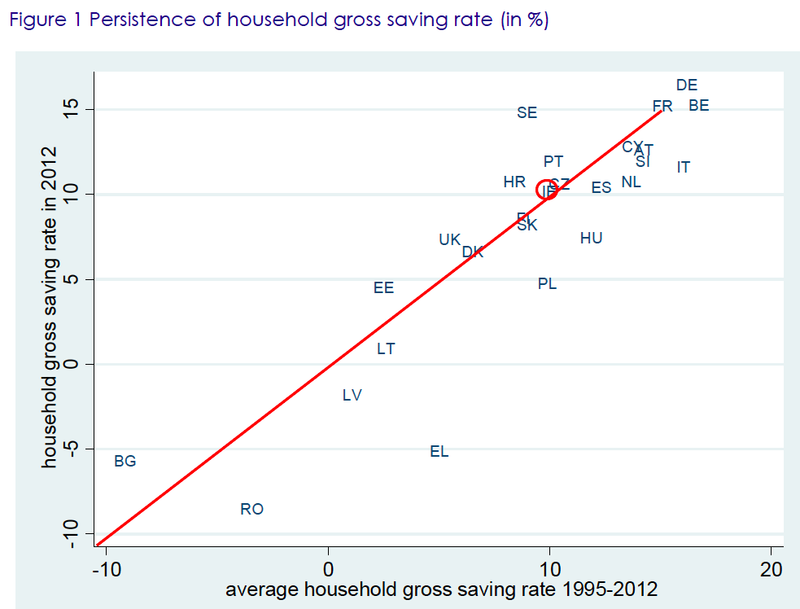 Remember the persistent whinging about 'high savings rates' in Ireland. And recall all the talk about how these savings are allegedly killing of domestic demand (because, of course, the 'recovery' has been supporting that demand, so if only the bad households stopped squirrelling away stashes of cash... then). Our savings rate was pretty darn low - fourteenth from the top in the EU - back in 2012. 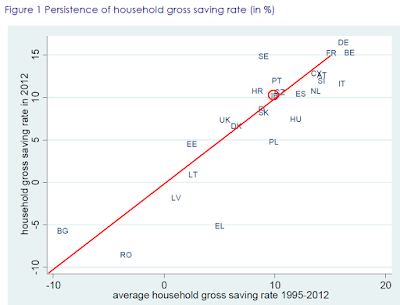 Our savings rate was pretty darn low over 1995-2012 horizon - fourteenth from the top in the EU. In fact, as the chart above illustrates, instead of jumping up in 2012 compared to 1995-2012 average, our rate stayed on average. Bang on it (we are on a red line). 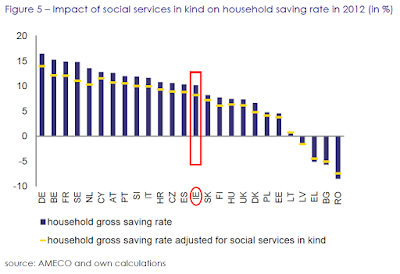 Of course, savings rates can be calculated differently across economies, so EU report distinguishes two sources of financial savings (savings used to purchase financial assets) and non-financial savings (savings used to purchase homes, gold etc). 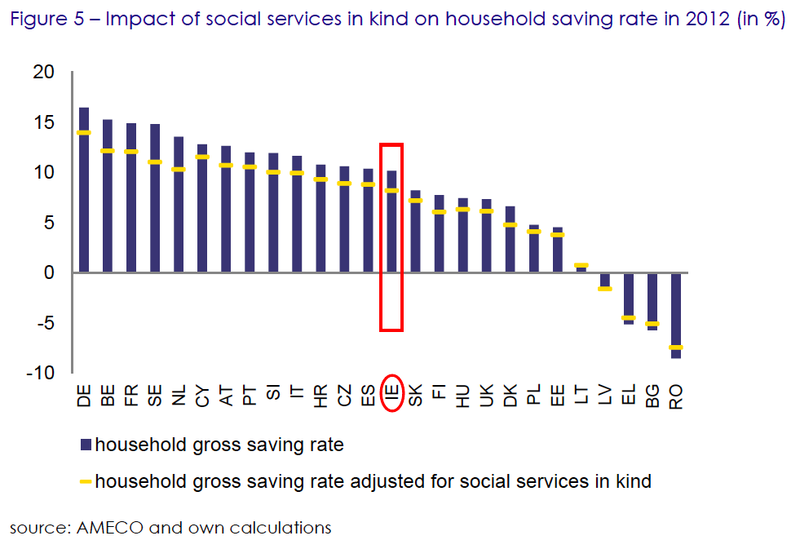 So may be, just may be the 'high rate of savings' was down to the latter (remember, Irish households were trying to repay their home mortgages as fast as possible)? Nope, not that either. 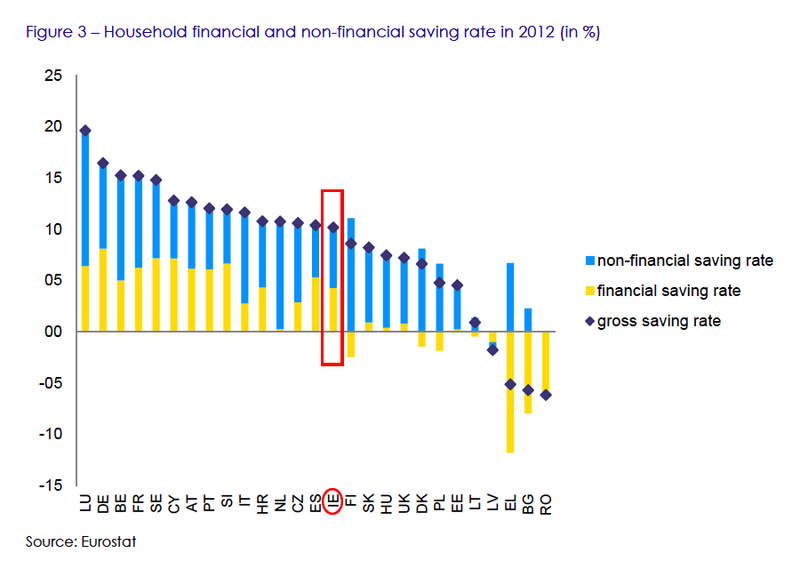 Per chart above, we rank 11th in the EU in terms of our financial savings rate and 19th in terms of non-financial savings. So what on earth was that 'high savings' story about? A business lobby-invented scheme to get the state to 'nudge' savings out of the banks and into spending? A state-concocted dream to justify potential (and in some cases actual, e.g. pensions levy and property tax) introduction of taxes on assets? A glitch in data caused by mortgages close-offs due to sales to unregulated foreign entities and to writedowns on banks balancesheets? Precuationary savings that went to fund relocation of younger adults abroad? Or a compensation in the accounts by increased financial (cash) savings offsetting somewhat decline in the values of non-financial savings (house prices tanking)? Or all of the above?